Malpighian Corpuscle: a walk on the wild side? 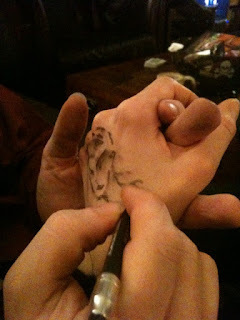 Apparently, if you want to whisk me away to a foreign country on a whim, draw on my hand and make me feel pretty. I met an artist at a party Friday. We talked about art and I grew excited because, well, I just finished a drawing class where I learned how to immortalize a pear as an amorphous blob of shadowy grays. So, see, with my new art skillz, I can haz art appreciation? He told me about lines and patterns and color and just for a moment the walls rippled, the world breathed and fiery souls flashed by. It was exciting just being in his presence because I borrowed his eyes for the briefest of moments and fantasized about a time when I would be able to see without the glasses of restraint and conformity. He looked at me like I was sculpted out of the hands of some great maestro and told me, "Your eyes are as deep as oceans." The benefit to not really having dated in 17 years (aside from aqua-eyed boy) is that I don't really know about all the modern "lines" guys use. Which is good, because then I can enjoy it. Heh. A girl can at least tell that and damn it is NICE. I've always wanted to go to Peru. I wish we could select all of our friends by picking from blogs we like. I think that's almost as good a method as any to finding like-minded kindred spirits.